the first time I saw an alcohol still. I was thirteen years old, sitting on the living room floor watching B.J. Hunnicut and Hawkeye Pierce making a martini in a wartime barracks on an episode of M*A*S*H. Maybe the main appeal of the still was the two of the coolest and funniest guys on Primetime TV had found the secret of making something that gave them an edge that the other members of the 4077 just didn’t have to surviving a bad situation. I thought to myself “How is it that these two guys make something that makes them so damned happy out of water and yeast?” It was right then that the idea of owning my own distiller got planted in my mind. Like most people, I finished high school and trade school, got a job, a wife and started on my path to being an adult by working as a TIG welder for a major corporation in Boulder, CO. The firm that employed me had over two hundred welders on the payroll and I was one of their top ten welders; all of my work had to pass inspection through an x-ray machine. I spent a large part of my time teaching and training other welders, but to me welding was more than just a job; it was an art form and I still feel that way to this day. I worked nights and shared a bench with another welder during the day shift. One evening I noticed he put a picture of an alcohol distiller up on the wall and it hung there over my bench for over two years while my co-worker began gathering the components to build a still. The pile of parts sat staked at the end of our workbench gathering dust for over a year until I finally decided to put it together. 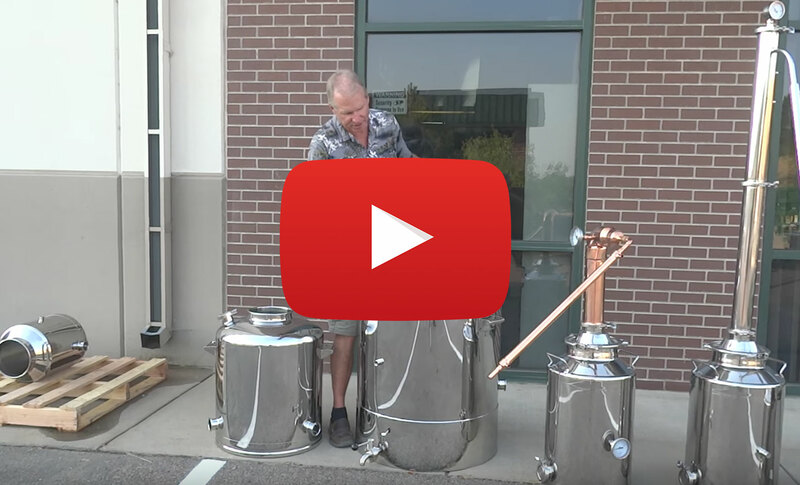 Once again, I became fascinated with the idea of perfecting a distiller so I began to make a few of them to sell on eBay, soon my customers were so pleased that I began to get orders from their friends. It was during this period that things began to change at the company where I worked. Management began to cut back on benefits, increased our workload, and began talking about outsourcing our jobs to Mexico. Realizing that my job was heading south, I focused on perfecting my design so I could begin making stills as my full time job. In the beginning I worked alone and was lucky to sell two stills a week. I was drop shipping the rest of my product items like yeast and essences from a supplier in Canada. After years of research and doing my homework, Mile Hi Distilling now carries its own inventory of everything needed to make perfect alcohol. We realize that for many of our customers making alcohol is more than just a hobby, it’s a tradition, an art form, a passion. For that reason, each distiller we produce is made to order, hand crafted to exacting standards, and designed to exceed your expectations. It is our goal that you be delighted with every product that we carry. We have a full time staff who are dedicated providing an excellent product and friendly service with a down home attitude. We are constantly working to improve our product line in order to bring you the best value and merchandise available because here at Mile Hi Distilling we realize that our success depends on your satisfaction. The road I took to making my dream become a reality has had a few detours along the way, but, Mile Hi Distilling has been around now for 13 years and we’re going strong. It’s my pleasure to do business with you and hope you’ll continue to travel along the road with me. Manufacturer of Reflux alcohol Milk Can moonshine stills. We cater to all your distilling needs. We carry the highest-quality alcohol still,ethanol still,Moonshine, Still, Turbo Yeast, Essences, Oak Barrels ,E85 Conversion Kits. We make a 2.8 gal still and a 26qt still also a 32qt still and a 40 qt alcohol still we also have an 8 gal milk can still and a 13 gal alcohol milk can still and all the parts for stills. So if you are looking for a still just take a look around the still page. Using stills for drinking alcohol is illegal in USA. But you can use these stills for oils and water and many other things. Also stills can be used for fuel alcohol. You can get a free alcohol fuel permit from the Federal government. So check with your local laws to own still.